This quickstart uses Visual Studio 2013. To download, see Get the tools. Open your existing Windows Runtime app project in Visual Studio 2013. From Solution Explorer, open the "Package.appxmanifest" file. You can also open this file from the menu bar by choosing Project, Store, and Edit App Manifest. Open the Visual Assets tab and select Splash Screen from the All Image Assets pane on the left side of the "Package.appxmanifest" window. If you're changing your splash screen for the first time, you'll see the "Assets\SplashScreen.png" path in the Splash Screen field. 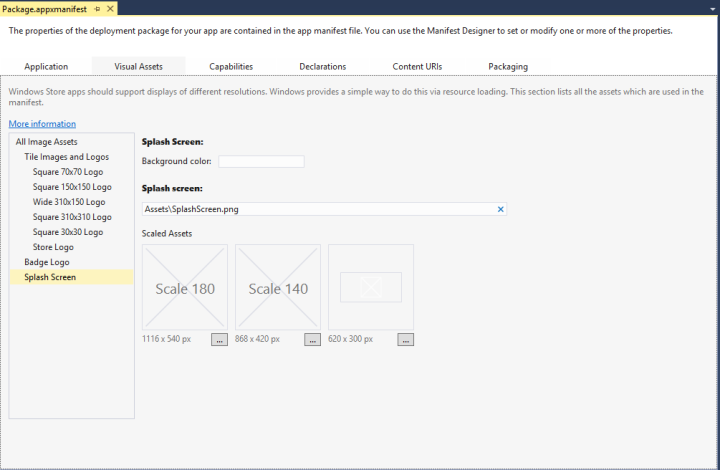 The following screen shot shows the "Package.appxmanifest" window in Visual Studio 2013. Depending on whether the project is for a Windows Store app or a Windows Phone Store app you will see a slightly different set of visual assets. To select a new splash screen image for a Windows Store app, press the button with an ellipsis that appears next to the 620 x 300 px label below Scaled Assets. Choose the 620 x 300 pixel image (.png, .jpg, or .jpeg) you'd like to use for your splash screen image. Important The splash screen image you choose must be 620 x 300 pixels using a 1x scaling factor. Also, when designing your splash screen, note that it is smaller than the screen, and centered. It does not fill the screen like a splash screen for a Windows Phone Store app does. To select a new splash screen image for a Windows Phone Store app, press the button with an ellipsis that appears next to the 1152 x 1920 px label below Scaled Assets. Choose the 1152 x 1920 pixel image (.png, .jpg, or .jpeg) you'd like to use for your splash screen image. Important The splash screen image you choose must be 1152 x 1920 pixels which is the correct size for a 2.4x scaling factor. If this is the only asset you provide then it will be scaled down for 1.4x and 1x scaling factors. In the Background Color field of the Splash Screen section, set the background color displayed with your splash screen image. You can enter either the name of a color or '#' and the hex value of a color. For a list of the names of available colors, see SplashScreen element. Setting a background color for your splash screen is optional. If you don't specify a color for a Windows Store app, the splash screen background color defaults to a light gray (hex value #464646). This is the same color as the default Tile background color (see the Background Color field of the Tile Images and Logos section in the Visual Assets tab). If you don't specify a color for a Windows Phone Store app, or set it to "transparent", then the splash screen background color will be transparent. If your app takes a while to load, consider adding an extended splash screen. For step-by-step guidance, see How to extend the splash screen. Learn about creating a good loading experience in Guidelines and checklist for splash screens. Want to know more about the other images required for a Windows Store app? See Choosing your app images.